For information on managing table schemas, see Modifying table schemas. You can create a partitioned table when you load data, or you can create an empty partitioned table and load the data later. When you load data into a partitioned table, you can use schema auto-detect for supported data formats, or you can specify the schema. Note: If you check the Automatically detect option in the classic BigQuery web UI, the Partitioning Type option is disabled. 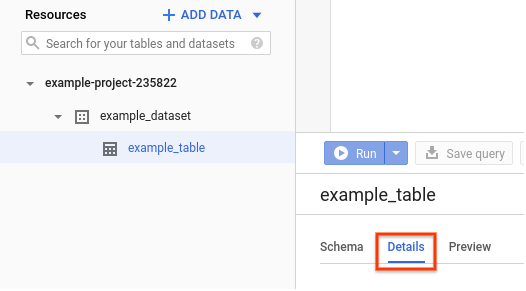 To use schema auto-detection when you load data into a partitioned table, use the GCP Console, the CLI, or the API. For more information on loading data from a local source into a partitioned table, see Loading data into BigQuery from a local data source. At the dataset level, browsing table data requires READER access to the dataset that contains the partitioned table being browsed. Instead of using dataset-level permissions, you can leverage an IAM role that includes bigquery.tables.getData permissions. All predefined, project-level IAM roles include bigquery.tables.getData permissions except for bigquery.user, bigquery.jobUser, and bigquery.metadataViewer. In addition, because the bigquery.user role has bigquery.datasets.create permissions, a user assigned to the bigquery.user role can read the data in any table in any dataset that user creates. When a user assigned to the bigquery.user role creates a dataset, that user is given OWNER access to the dataset if no other owner is set. OWNER access to a dataset gives the user full control over it and all the tables in it. In the GCP Console, in the navigation pane click a dataset to list its tables and views. Click a partitioned table in the list. You cannot preview individual partitions by using the BigQuery web UI. Note the value in Number of Rows. You may need this value to control the starting point for your results using the CLI or API. Click the Preview tab. A sample set of data is displayed. Cick Details and note the value in Number of Rows. You may need this value to control the starting point for your results using the CLI or API. Click Preview. A sample set of data is displayed. Issue the bq head command with the --max_rows flag to list all fields in a particular number of table rows. If --max_rows is not specified, the default is 100. Specify a partition to browse using the partition decorator, for example, $20180224. Because the bq head command does not create a query job, bq head commands do not appear in your query history, and you are not charged for them. To browse a subset of fields in the table (including nested and repeated fields), use the --selected_fields flag and enter the fields as a comma-separated list. To specify the number of rows to skip before displaying table data, use the --start_row=[INTEGER] flag (or the -s shortcut). The default value is 0. You can retrieve the number of rows in a table by using the bq show command to retrieve table information. If the table you're browsing is in a project other than your default project, add the project ID to the command in the following format: [PROJECT_ID]:[DATASET].[TABLE]. [INTEGER1] is the number of rows to display. [INTEGER2] is the number of rows to skip before displaying data. [FIELDS] is a comma-separated list of fields. [DATASET] is the name of the dataset containing the table. [TABLE] is the name of the table to browse. [PARTITION] is the partition decorator. Enter the following command to list all fields in the first 10 rows in mydataset.mytable in the "2018-02-24" partition. mydataset is in your default project. Enter the following command to list all fields in the first 100 rows in mydataset.mytable in the "2016-09-01" partition. mydataset is in myotherproject, not your default project. Enter the following command to display only field1 and field2 in mydataset.mytable in the "2016-09-01" partition. The command uses the --start_row flag to skip to row 100. mydataset.mytable is in your default project. Browse through a table's data by calling tabledata.list. Specify the name of the table and partition decorator in the tableId parameter. Note: If you request a startIndex beyond the last row, the method will return successfully but without a rows property. You can find out how many rows are in your table by calling the tables.get method and examining the numRows property. Values are returned wrapped in a JSON object that you must parse, as described in the tabledata.list reference documentation. By default, BigQuery runs interactive queries, which means that the query is executed as soon as possible. BigQuery also offers batch queries. BigQuery queues each batch query on your behalf and starts the query as soon as idle resources are available, usually within a few minutes. For more information, see Querying partitioned tables. You can overwrite partitioned table data using a load or query operation. You can append additional data to an existing partitioned table by performing a load-append operation or by appending query results. In addition, because the bigquery.user role has bigquery.datasets.create permissions, a user assigned to the bigquery.user role can overwrite or append data in any partition of any table that user creates in the dataset. When a user assigned to the bigquery.user role creates a dataset, that user is given OWNER access to the dataset if no other owner is specified. OWNER access to a dataset gives the user full control over it, all the tables in it, and all the table partitions. You can append to or overwrite partitions by using the bq load command or by calling the jobs.insert method and configuring a load job. The GCP Console and the classic BigQuery web UI do not support appending to or overwriting a partition in a load job. When you load data from Cloud Storage, the bucket must be in the same location as the BigQuery dataset. The data you're loading must conform to the table's partitioning scheme. All rows written to the partition should have values that fall within the partition's date. Because partitions in a partitioned table share the table schema, replacing data in a partition will not replace the schema of the table. Instead, the schema of the new data must be compatible with the table schema. For information on updating the table's schema in the load job, see Managing table schemas. When you append data to an ingestion-time partitioned table, if you do not specify a partition decorator, the current partition is used. --noreplace WRITE_APPEND Appends the data to an existing partition. If no write disposition option is specified, the default action is to append the data to the partition. --replace WRITE_TRUNCATE Overwrites (restates) a partition. For example, the following command replaces the data in the entire partition for the date January 1, 2016 (20160101) in a partitioned table named mydataset.table1. The JSON data is loaded from a Cloud Storage bucket. The Cloud Storage bucket and the BigQuery dataset were created in the asia-northeast1 region. Note: The partition decorator separator ($) is a special variable in the unix shell. You might have to escape the decorator when you use the command-line tool. The following examples escape the partition decorator: mydataset.table\$20160519, 'mydataset.table$20160519'. You can append to or overwrite partitions by using the bq query command or by calling the jobs.insert method and configuring a query job. The GCP Console and the classic BigQuery web UI do not support appending to or overwriting a partition in a query job. The tables you're querying must be in the same location as the table you're appending or overwriting. When you append to or overwrite a partition in an ingestion-time partitioned table, you can use either legacy SQL or standard SQL syntax. When you append to or overwrite a partition in a partitioned table, your query must use standard SQL syntax. Currently, legacy SQL is not supported for querying partitioned tables or for writing query results to partitioned tables. When writing query results to a partition, the data that is being written to the partition must conform to the table's partitioning scheme. All rows written to the partition should have values that fall within the partition's date. --append_table WRITE_APPEND Appends the query results to an existing partition. --replace WRITE_TRUNCATE Overwrites (restates) a partition using the query results. If the destination table exists, and it is not partitioned, the following error is returned: BigQuery error in query operation: Error processing job '[PROJECT][JOB_ID]' Incompatible table partitioning specification. Expects partitioning specification interval (type:day), but input partitioning specification is none. For more information on using query results to append to or overwrite data, see Writing query results. You can modify data in a partitioned table using DML statements in the standard SQL dialect. DML statements allow you to perform bulk row updates, insertions, and deletions. For examples on using DML with partitioned tables, see Updating partitioned table data using DML statements. The legacy SQL dialect does not support DML statements. To update or delete data using legacy SQL, you must delete the partitioned table and then recreate it with new data. Alternatively, you can write a query that modifies the data and write the query results to a new, partitioned table. For more information on copying tables, see Copying a table. You can copy one or more partitions by using the command-line tool's bq cp command, or by calling the jobs.insert API method and configuring a copy job. Copying partitions is not currently supported by the GCP Console or the classic BigQuery web UI. For more information on copying partitions, see Copying partitions. This command is used to demonstrate using the partition decorator. The bq insert command is meant for testing only. To stream data into BigQuery, use the API's tabledata.insertAll method. For more information on streaming data into partitions, see Streaming into partitioned tables. When streaming using a partition decorator, you can stream to partitions within the last 30 days in the past and 5 days in the future relative to the current date, based on current UTC time. To write to partitions for dates outside these allowed bounds, you can use load or query jobs. When you specify a time-partitioned table as the destination table when you stream data, each partition has a streaming buffer. The streaming buffer is retained when you perform a load, query, or copy job that overwrites a partition by setting the writeDisposition property to WRITE_TRUNCATE. If you want to remove the streaming buffer, verify that the streaming buffer is empty by calling tables.get on the partition. Exporting data from a partitioned table is the same process as exporting data from a non-partitioned table. Currently, it is not possible to export individual partitions. For more information, see Exporting table data. You can export partitioned table data in CSV, JSON, or Avro format. Currently, you must export data into a Cloud Storage bucket. Exporting to your local machine is not supported; however, you can download and save query results using the GCP Console or the classic BigQuery web UI.